Due to a decrease in bookings this year we have made the decision to go back on line with the big agents like Booking.com. They do charge us a high commission charge so hopefully we you would like to book so please call us directly on 01424 212269 for our best rates as sometimes the rate published on line are slightly higher than we would like to charge. Hope to hear from you soon. We’re pleased to announce that Buenos Aires Guest House has been recognised with a 2017 Certificate of Excellence, based on the consistently great reviews you’ve earned on TripAdvisor. Spring is in the air and Bexhill is certainly developing with new and exciting restaurants opening as well as the the usual good charity shops that all towns have. We have all types of rooms for all budgets just give us a call and come and explore Bexhill on Sea for a mini break. 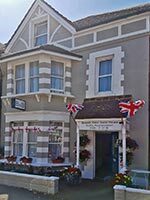 Congratulations to our Guest House as we have won Bexhill in Bloom Hotel/Guest House category again. Well done Andy for all your watering. May 2015 – Unfortunately due to quite a few late minute cancellations just within our 48 policy we have now had to increase our policy to 5 days notice required rather than the original 48 hours. We have not taken this decision lightly but obviously for those who know us will understand why. Obviously we do take individual reasons into consideration and if we manage to fill the room/s we would certainly not charge for the cancellation but this may help others being disappointed and we have empty rooms at peak and popular periods. 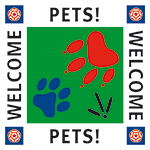 January 2016 – To all out past and future guests just to let you know we had our Quality in Tourism assessment yesterday and our pleased to announce that we still have our Four Star silver award along with the Good breakfast and Welcome Pets and Walkers accolades. See Andy my nagging pays off! So we can assure you that “Making your stay a comfortable one” is also along standards set by national “Quality in Tourism” for another year. February 2014 – We have just had our annual mystery guests stay from Quality in Tourism and are pleased to announce that we have once again been awarded the Four Star Silver award with the breakfast accolade. The assessors gave us some ideas of which most we have addressed already and we have another couple that our on our maintenance programme. We are so pleased to have this review written by Stephen Emms review who founded the Kentish Towner which is an award winning cultural guide. The article is about the De La Warr, Bexhill town shops and restaurants and us in the accommodation section!! Have a look we are so proud and so should Bexhill. BEXHILL IN BLOOM 2014 – WE WON!! Despite having more flowers and pots stolen and as for next year we now have CCTV so hopefully we will be able to catch our repetitive thieves. BEXHILL IN BLOOM 2013 – WE WON!! Last night we attended the Bexhill in Bloom award evening where we were delighted to win the first prize in the Hotel/Guest House category. We would like to thank the Head gardener – Noel Austin (Rachel’s mum) for her artistic inspiration. The theme for this year was red, white and blue flowers in hanging baskets, apple boxes, tin watering cans and even a tin bath to also celebrate the Diamond Jubilee year two crowns were created one for 1952 and the other for 2012. The flowers unfortunately now have finished for this year but we shall be thinking ahead for the theme for next year.